Happy New Year! Today starts my second Year in Recipes. In 2010, each of my weekly posts was about trying a new recipe from one of my many cookbooks. This year, I’ll broaden my scope. The time spent making new recipes from old books served its purpose: It got me back into my books and back into kitchen exploration. Now I want to mix things up a bit more – some old favorites, along with new dishes. I’m starting with my own recipes for lentils and cotechino, a much-loved New Year’s Day dish. 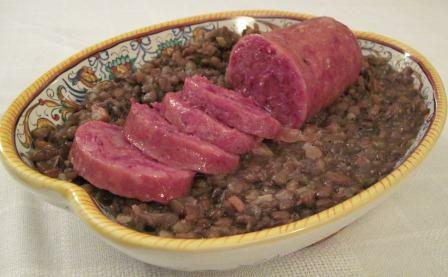 In Italy, lentils are traditional for January 1st. The idea is that lentils look like coins, and the more of them you eat on the first day of the year, the more money you’ll have that year. It can’t hurt to try, can it? There’s a recipe for stewed lentils in the first cookbook that Tom and I published, La Tavola Italiana. That was over 20 years ago, shockingly enough, and I’ve changed a few things since then. I used to soak lentils, the way you do dried beans, but now I find it isn’t necessary. I just pick them over and rinse them. I sauté carrot, onion, celery, garlic, and sage leaves in olive oil; stir in the lentils and sauté briefly; then add broth and cook gently, covered, until the lentils are tender. Cooking time varies greatly, depending on the age and type of lentils used. My favorites are the small brown Castelluccio lentils, from Umbria. Here is my current version of the recipe. La Tavola Italiana also has a recipe for making cotechino, a big, luscious boiling sausage made from ground pork meat, pork fat, pork skin, and spices. Cotechino is much more readily available in butcher shops nowadays, but if you know the sausage as made in the north of Italy, you’ll find many American versions disappointing – which is why Tom and I developed our own. It’s quite a lot of work to make, albeit fun if you enjoy messing around in the kitchen. Happily, for the past few years my local Citarella market has carried an imported Italian brand of cotechino, Levoni, that has the true, characteristic unctuousness and zesty flavor. It’s fully cooked, needing only to be heated in boiling water in its aluminum-foil pouch for 20 minutes. That’s a godsend, since to make it from scratch the sausage mixture has to be shaped into a fat cylinder, rolled up in a sheet of caul fat, aged in the refrigerator for 3 days, soaked in cold water for 8 hours, then drained and simmered in fresh water for 2 hours. Not exactly a spur-of-the-moment dish to make. So for dinner on New Year’s Day I made a Levoni cotechino and my lentil recipe, with which we drank a 1990 Banfi Brunello di Montalcino, and very good they all were, the bracing Sangiovese fruit and acidity of the wine making a lovely foil for the unctuous sausage and earthy lentils. Now I’m just sitting back and waiting for the lentil-induced money to start pouring in. P.S. Leftover lentils make a nice antipasto or first course, served warm or at room temperature with a drizzle of olive oil and minced onion. So does leftover cotechino, sliced and served with a potato salad dressed with olive oil, wine vinegar, and chopped parsley. Can’t wait to continue the culinary journey with you, Diane! From Venice I can report that I have already eaten my New Year’s portion of lentils and cotecchino. Italians always like to debate the best way to cook any dish and the table I just left had a big discussion about cotechino and how it absolutely must be steamed on a rack, never boiled. Maybe Citarella’s aluminum pouch serves that purpose?? I am so glad you are continuing your weekly encouragement to getting me back in the kitchen! Thanks for last year, and I look forward to 2011 revelations! Steamed? Interesting. I’ve never heard of that, Betty. 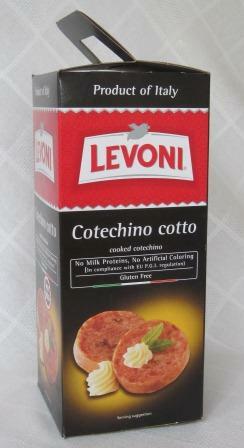 The Levoni carton doesn’t say how its cotechino was cooked originally. The company’s website says it follows an ancient recipe from Mantova. But then is also says it uses “a special process for pre-cooking and draining, which preserves the products’ organoleptic features and eliminates most of the liquid before vacuum packing. The product is then stabilised with a second cooking process.” Doesn’t sound much like an ancient procedure! But it sure has a good result. I wish we could get its zampone in New York. I’m so glad you’re continuing your blog. Reading it is a healthy weekly habit! (Even though I don’t eat meat!) Am looking forward to making the lentil soup next week. Thanks for the recipe! Teresa, I hadn’t realized you weren’t eating meat any more. You used to, didn’t you? But I’m that much more flattered that you enjoy reading about my dishes — many of which I must admit involve animal protein! Anyway, Happy New Year to you, and thanks for reading my blog.